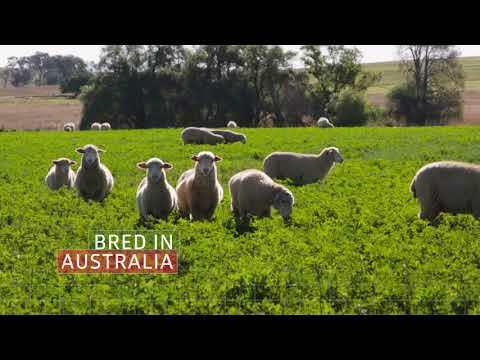 Australian bred Titan 7 is a winter-active lucerne variety best recommended for irrigation and dryland conditions. It is multi-purposed for grazing and hay production and provides a high quality yield when sown in autumn, early winter or early spring, with best results achieved when sown into a moist firm seedbed. It offers superior insect and disease resistance, withstanding Phytophthora Root Rot and all three strains of Colletotrichum Crown Rot. My clients are happy with the quality of hay I am cutting off the Titan 7. It's a good leafy variety, holds its leaf absolutely spot on and it did so with one cut that got some light showers on it too. I am happy with the variety and cannot see why you would grow anything else. Near Gulgong, NSW, this Titan 7 Lucerne sown in April two years ago is still a top quality feed reserve. Consistently used to fatten up to 400 lambs, this stand remains free of insect, disease and weed problems. A crop of Titan 7 lucerne in the Hunter showcasing its persistence even after 300mm rain. The local hay producer is impressed by no waterlogging issues, its survival and superior yield compared to others he has used in the past. Titan 7 Lucerne crop on a farm in Maitland NSW, ready for cutting and bailing next week. Trevor and Gloria Sippel planted Titan 7 lucerne alongside strips of a competitor's winter active variety at Toolgoolawah. After two years the competitor variety has been ploughed out and the Titan 7 continues to perform strongly. Trevor commented, "The Titan 7 has responded well after flooding this summer with 40 inches of rain in eight weeks and it is still growing. We have had some very good yields off the Titan 7 and really noticed the disease resistance compared to the other variety. I was also impressed with the SowEasy KickStart® coat on the lucerne seed at sowing, it had a uniform seed size and wasn't dusty like some other products. We are so impressed with Titan 7 we are sowing more this autumn." Mark Green has been growing lucerne as the mainstay of his mixed farming system at Forbes for 30 years. "I pick my lucerne varieties based on their sustainability and persistence, yield potential and ability to preform well on different soil types, Titan 7 is a good all rounder. It is winter active, but not highly winter active, with more even growth through the other seasons than some varieties. It is an aggressive variety that grows quickly and recovers quickly after grazing. Titan also shows very high growth rates during the summer, for up to seven cuts a year. The protein is up to 25% and it offers good leaf retention for a high quality hay," he said. Mark and Janice Williams planted 18 acres of Titan 7 lucerne in September 2011 at Westbook. "We are very happy with Titan 7, we sowed it at 35 kg/ha and found it produced great quality hay. I like the 7 activity as we don't find it worthwhile to produce hay during the winter. The Titan handled the wet weather and excess water very well during the past summer drenching rains. The yield has been very good particularly compared to the L56 planted beside it under the same centre pivot. I will certainly be planting more of the Titan next spring." Glenn Moxey, his wife Colleen and son Shane grow 300 hectares of luceren and a further 300 hectares of cereal hay under irrigation, with wheat, canola and cattle on their 1,400 hectare property just outside of Forbes. "Our assessment is that Titan 7 is leafy, tall and fine stemmed, all the traits our horse customers are looking for. In our experience, Titan 7 also responds well to flood irrigation, regrows quickly after cutting and appears more disease resistant. This disease resistance means our lucerne stands are lasting for five years, a year or two longer than other varieties," commented Glenn. A Titan 7 lucerne stand ready to be cut for hay. This stand is 4 years old and has been cut 6 or 7 times each year for hay and is also grazed by ewes and lambs. Usually it is watered by flood irrigation twice between cuts and cut every 25-28 days. An alternative approach to planting mixed fescue and lucerne pastures is providing benefits for farmers who have noticed a more effective and reliable establishment of their pastures.In April 2014, Brad oversaw the sowing of a paddock of Flecha Mediterranean tall fescue and Titan 7 lucerne with a Conner Shea 8000 direct drill. The Flecha was sown through one seed box and the Titan 7 sown through the other.Traditionally these fescue/lucerne pastures would be sown as a mix in the same sowing row and therefore competing against each other for nutrients and water. Quick establishment in the autumn in preparation for winter growth is a hallmark of the varieties in this mix. Mach 1 annual ryegrass and Atom Prairie grass also provide quality feed throughout the winter and into the spring. Combine this with the quality of the medic and lucerne and you can be assured of a quality pasture blend. Soil type Clay loams/heavy clays Annual rainfall 650 mm+ or irrigation Sowing rate 20-30 kg/ha Fertility High Persistence* 5 years+ Sowing time Early autumn/spring Establishment Medium &nbsp;*Persistence will be influenced by a number of facts and is not guaranteed Please note: All equine pastures MUST be rested throughout the year and should never be overgrazed during the summer period. Please refer to our Equine Mix brochure for more management tips. A careful selection with tetraploid rhodes grass for quality and quantity of summer growth, plus a bluegrass species ensures this quality but also adds drought tolerance in case of unfavourable conditions. Combine this with prairie grass for winter, spring activity, then add lucerne and a vigorous white clover and there is potential for hay production as well. Soil type Wide range Annual rainfall 550 mm+ Sowing rate 20-30 kg/ha Fertility Medium-high Persistence* 4 years+ Sowing time Autumn Establishment Fast &nbsp;*Persistence will be influenced by a number of facts and is not guaranteed Please note: All equine pastures MUST be rested throughout the year and should never be overgrazed during the summer period. Please refer to our Equine Mix brochure for more management tips.